View all of the very best Wine & Champagne offers available for this August bank holiday. Including our exclusive deals using our Wine Vouchers which could save you up to an additional £100 off of your order. If your looking for a deal on a specific Wine or Champagne use our Wine Search or if you fancy something special why not look at some the Award Winning Wines and grab a great deal. 25% Off Two Cases Of Wine At M&S! Limited Time Offer For M&S! 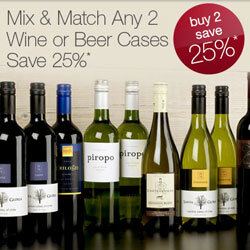 Marks & Spencers are offering a mix and match 25% off when you purchase any two cases of wine* or beer on their site. Click now to view the offers and see how much you can save.